When the sun is shining and the temperatures soar the majority of us turn to ice cream. It is easy to reach into the freezer and pull out a carton, but it is also easy to make your own. This fresh peach ice cream shows you just how easy it is and that there need be no anxiety about not having an ice cream machine to make it. If you have one fine, you can still use that, but it's not essential for this easy, homemade batch of ice cream. In a medium-sized bowl, whisk the sugar and egg yolks together until light and fluffy. Heat the cream to almost boiling (do not boil or it may curdle, and you will have to throw it away), take from the heat, and cool slightly. Then add the vanilla extract and stir. While quickly whisking, slowly pour the warmed cream into the egg and sugar mixture. Once all added, continue to whisk for another minute to make sure there are no lumps. Cover the surface of the cream with a circle of greaseproof paper and leave to cool. Placing the paper on the surface prevents a skin from forming which you do not want as this will make the ice cream lumpy. If the eggs start to become lumpy due to the heat of the cream, you can always pass the mixture through a fine mesh strainer to remove those lumps. Meanwhile, skin the peaches, cut in half, and remove the stone (aka pit). Put half of the peaches to one side. Dice the remaining peaches and add to the custard base and stir. The peaches and cream can then either be churned in an ice cream maker, if you have one, following the manufacturer's instructions (there are so many different types of ice cream machine). Or, pour the mixture into a shallow plastic container (old ice cream cartons are suitable for this) cover with a lid and pop it into the freezer. Check every couple of hours and as the cream starts to freeze, give it a good mix with a whisk to break up the ice crystals. You will need to do this three or four times. It is worth doing, as you will create a lovely smooth cream. With the rest of the peaches, blast them with an immersion blender or use a food processor for a lovely sauce to pour over the ice cream. Do not over blend; it works to have small chunks of peach. Taste and if it seems a little sharp, add a small dab of honey and stir through. The purée also freezes well if you are not eating the ice cream. Before serving, remove the ice cream from the freezer for about 10 minutes to soften it slightly. Do be aware that as this ice cream is homemade and with no additives, it will melt quicker than a shop bought variety, but boy does it taste good. 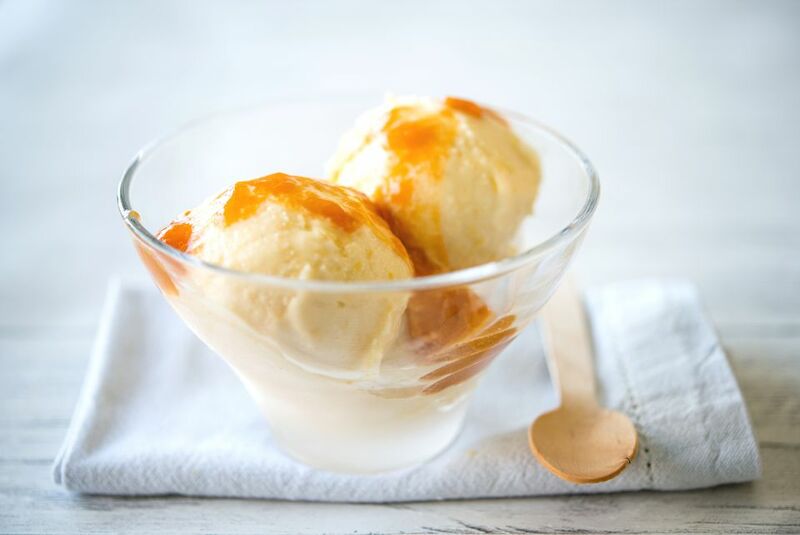 For an adult version of this ice cream add a little of your favorite peach liqueur to the cream before it cools.